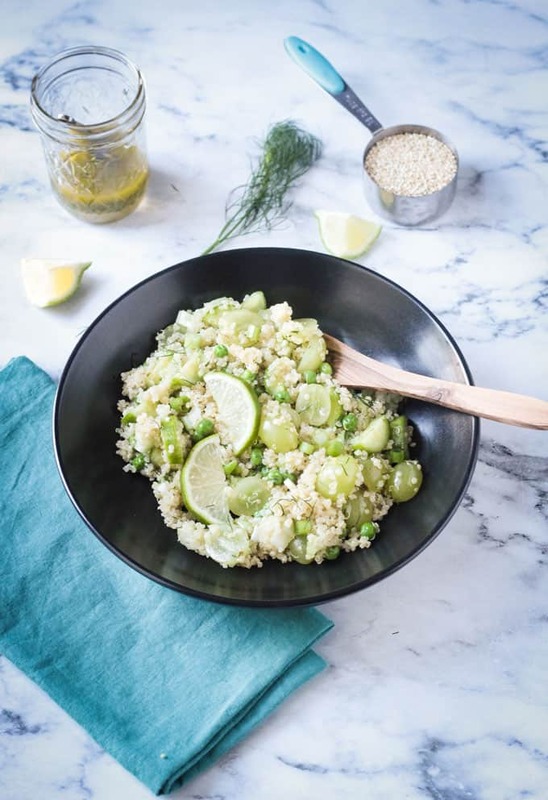 Healthy Vegan Quinoa Salad w/ Fresh Dill & Lime Vinaigrette – a light and refreshing, yet high protein salad that’s perfect for spring or summer. I’m all about easy salads for lunch and dinner in the summer. I even sometimes eat them for breakfast! Recipes that can be thrown together in a hurry with few ingredients, and minimal prep time are key. But, that doesn’t mean I’m eating lettuce all day long. My Quick and Easy White Bean Salad, Curried Tofu Salad, Chickpea Salad, and Raw Veggie Chopped Salad have all been in heavy rotation and not a leaf of lettuce in any of them! 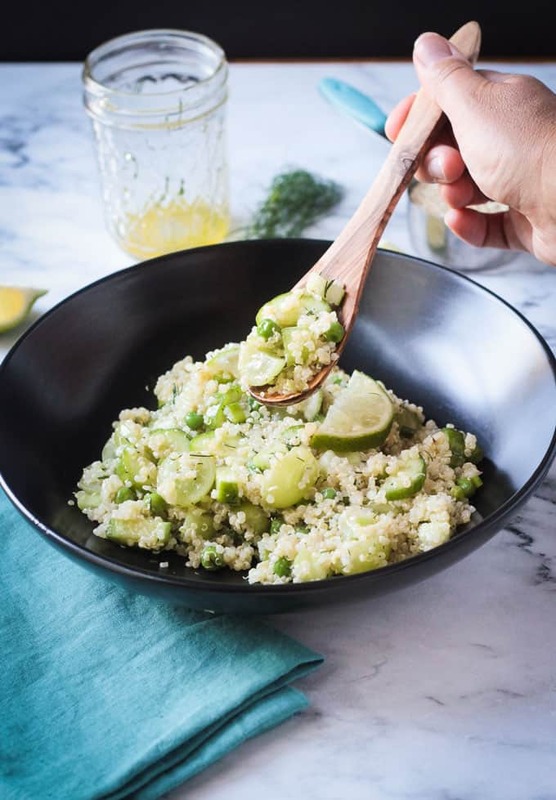 This healthy Vegan Quinoa Salad w/ Fresh Dill & Lime Vinaigrette is joining the ranks of my favorite light summer recipes. I know you’re going to love it, too! 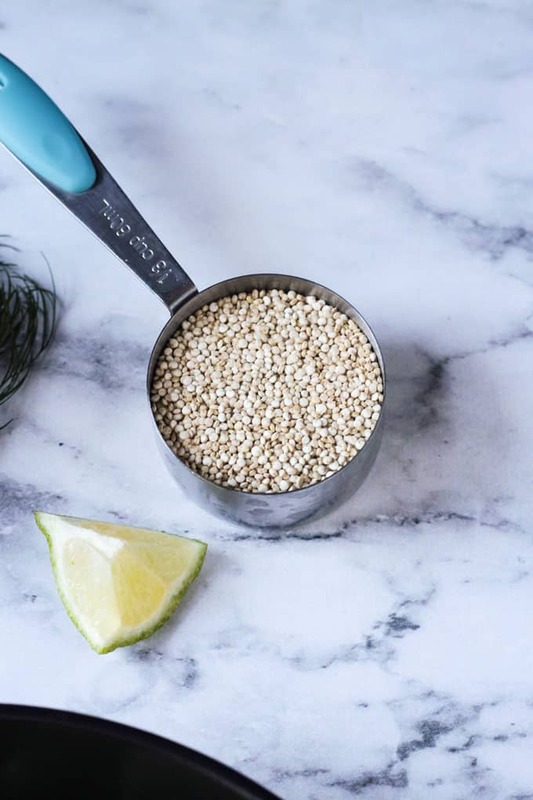 Full of high quality plant protein (containing all nine essential amino acids), fiber, iron, potassium, B vitamins, calcium, and so much more, quinoa packs a healthy nutrient punch. Naturally gluten free, it’s a seed that cooks up like a grain. You can use it just as you would rice or couscous. Along with our quinoa today, we’re bringing all things green, but no lettuce or leafy greens. 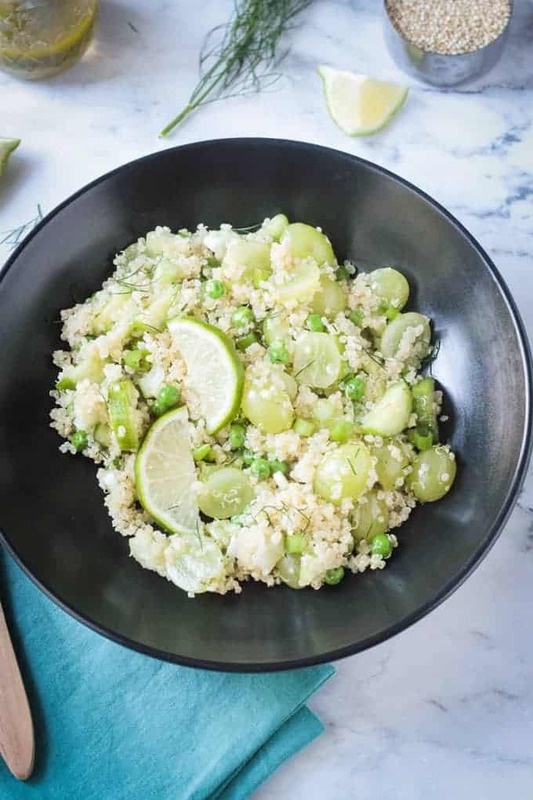 It’s summer and it’s hot, so I chose refreshing, hydrating fruits and veggies to enhance this vegan quinoa salad. And there’s no need to cook them – just chop and throw in the bowl. The only exception to this is the green peas. I used frozen peas and I simply added them to the hot pot of quinoa to steam them for a minute or two. It’s fun eating green when it tastes this good. Juicy grapes, crunchy celery, crisp cucumber, spicy green onion, sweet green peas, and herby dill all contribute to the deliciousness. Other “greens’ that would be tasty in this quinoa salad: diced green apple, sliced zucchini, and avocado. Pick your faves and make it your own. 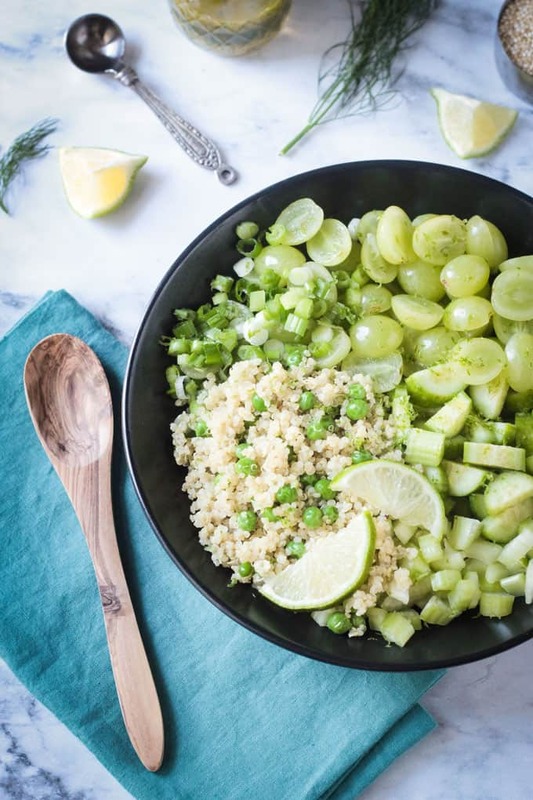 I was originally going to make a lemon vinaigrette for this healthy quinoa salad, but in the end I decided to keep to the green theme and went with lime instead. It’s bright and tangy, but not overpowering at all. The recipe makes a good amount of dressing and you may not want to use it all since the salad is so flavorful on it’s own. Drizzle a little and add more to your liking. This salad comes together in the amount of time it takes to cook the quinoa….about 10 minutes. 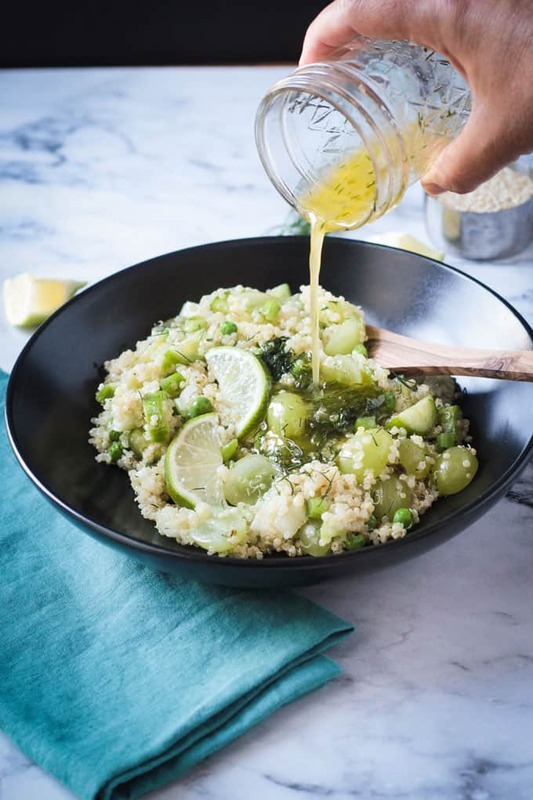 If you chop the veggies and whisk the dressing while the quinoa is cooking, it shouldn’t take you more than about 15 minutes. It can be eaten right away while the quinoa is still warm, but it’s equally as yummy eaten cold or room temperature. This makes it a versatile dish that could easily be packed up for lunches-on-the-go, like picnics, potlucks, or school lunch boxes. It’s an easy make-ahead dish too. I hope you love this Vegan Quinoa Salad w/ Fresh Dill & Lime Vinaigrette as much as we do. If you try it, please come back and leave me a comment below with your feedback and star rating. You can also find me on social media. Be sure to tag @veggie_inspired and #veggieinspired so I’m sure to see it. Enjoy! 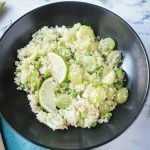 Healthy Vegan Quinoa Salad w/ Fresh Dill & Lime Vinaigrette - a light and refreshing, yet high protein salad, that's perfect for spring or summer. Rinse the quinoa in a fine mesh strainer under cold water. Drain. Place the quinoa and water in a small pot on the stove. Bring to a boil. 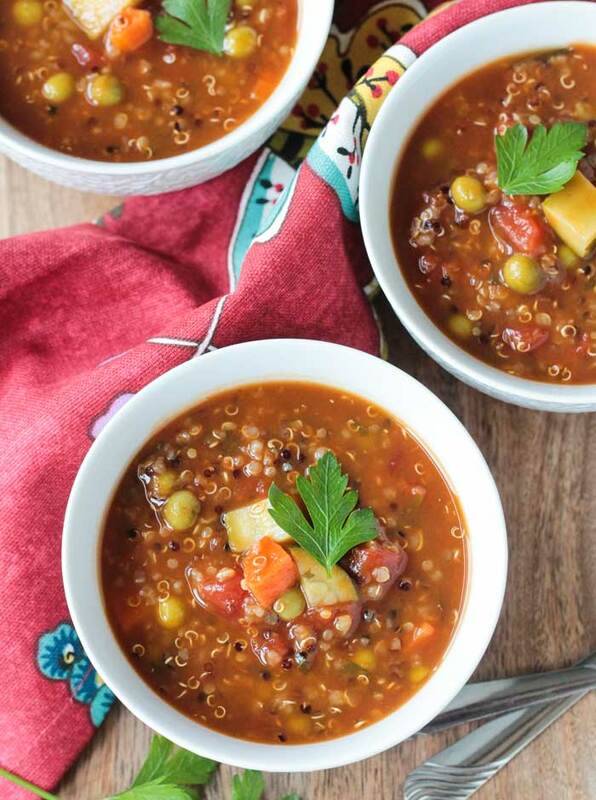 Reduce heat to medium-low, cover, and simmer for 10 minutes or until the quinoa is tender and the water is absorbed. Fluff with a fork. Take the quinoa off of the heat, add the peas, and replace the cover to steam the peas. Add the diced cucumber, halved green grapes, diced celery, and sliced green onions to a large mixing bowl. Set aside. In a small bowl or jar, whisk the chopped dill, lime zest, lime juice, apple cider vinegar, oil, salt, and pepper. 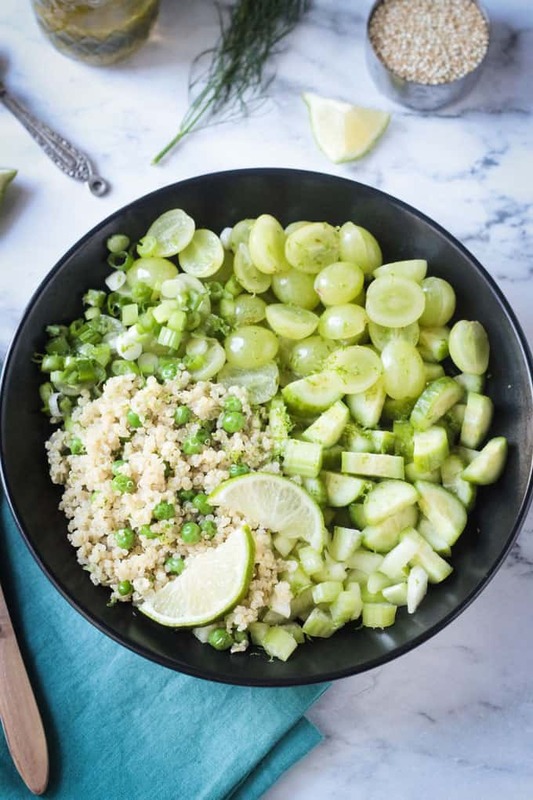 Add the quinoa to the bowl of vegetables & grapes. Drizzle as much or as little of the dressing onto the salad as you like. Taste and adjust seasonings as necessary. Serve immediately or store tightly covered in the fridge until ready to serve. *You could use any color of quinoa in this recipe. I use the white because I love the way it makes all the green colors from the vegetables and grapes pop. The sweetness of the grapes and baby peas, crunch of the fresh cucumber and celery, and the balance with those green onions. Yum! Only made better with that scrummy lime and dill dressing! I thought the dressing was a little polarizing at first and added a little stevia. That wasn’t necessary once incorporated with the salad; luckily I didn’t add much. My Bad! The only other thing I might consider adding is some toasted flaked almonds. I’m so glad you loved it, Natalie! I could nearly eat the whole thing myself, too. As a side, it would/could feed 6. LOL! And I agree, a lot of dressings need to be a bit sharp at first bite because once they get mixed with the other ingredients, those flavors all mellow out a bit. 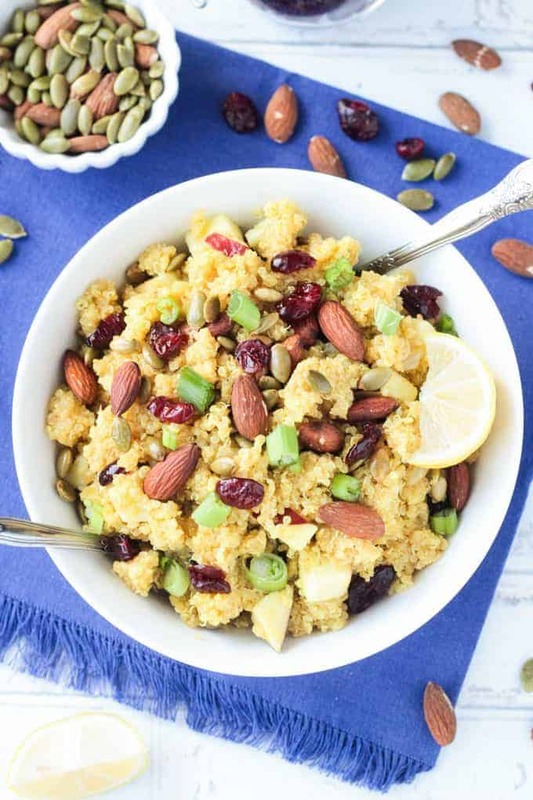 What a fresh way to enjoy quinoa! My husband loves dill, so I use it often, but I’ve never thought to pair it with so many flavors. Thanks, Alisa! I’m with your hubby – fresh dill is the BEST! 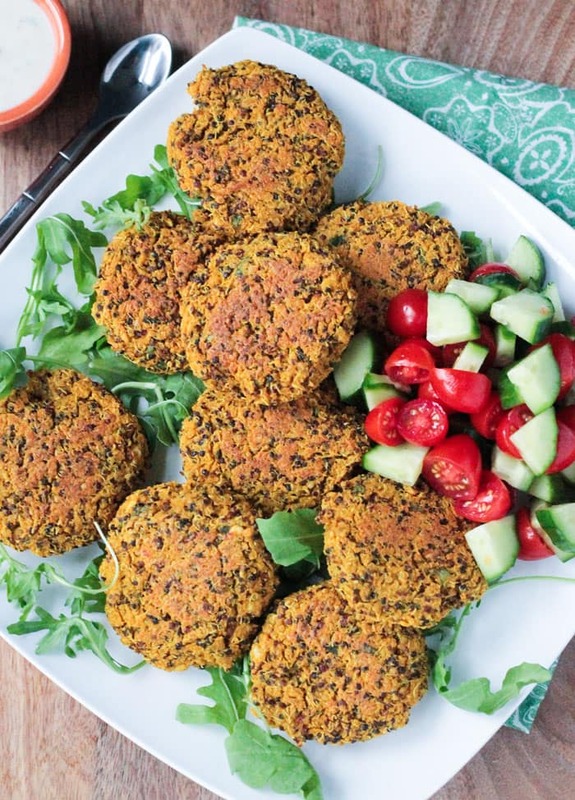 I love anything quinoa so this looks fab! I don’t think I’ve ever put grapes in a savory salad before though, definitely have to try it! You definitely need to try it. I promise you’ll love it! I would never have thought of adding grapes to a salad like this, it sounds so delicious! I’m addicted to adding grapes to savory salads. I think this is my fourth savory salad recipe with grapes on this blog. LOL! Hope you love it, Emily! I adore grapes in savory salads — definitely need to try this! I put grapes in so many savory things. It’s an addiction. 🙂 Thanks, Tara! This salad sounds perfect. I’m always looking for new ways to use quinoa. I have everything to make this salad but the grapes. So I’m getting some grapes & can’t wait to try this! Love how healthy and easy this is! And that dressing! We love all things with dill around here. Fresh dill is my fave! I hope you enjoy this salad! Thanks, Lisa!